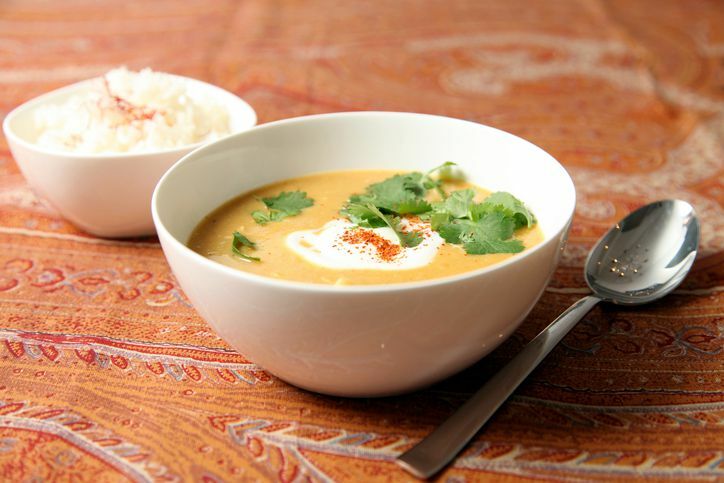 This delicious Anglo-Indian soup is a product of the British Raj in India. Mulligatawny is ​chicken soup flavored with Indian spices. Make your mulligatawny a satisfying meal by serving it with ​basmati rice or with a chunk of crusty bread! Heat the oil over medium heat in a deep pan/pot. Add the bay leaf and fry for 30 seconds. Add the onion and fry until transparent. Add the garlic and fry for a minute. Add all the powdered spices and fry for 2 to 3 minutes. Add the chicken and fry till sealed/ lightly browned. Add the Toor Daal and fry for a minute. If you're using the mixed vegetables, add them now. Add the chicken stock and simmer. Cook till the Daal is soft. When Daal is cooked/soft, add the coconut milk. Mix well. Turn off heat, add lemon juice and mix. Serve hot in individual bowls, poured over a bed of cooked basmati rice. Garnish with chopped fresh coriander.